This blog is dedicated to all about Exynos 7904 vs Snapdragon 660 comparison on the ground of its CPU and GPU usage, its Camera, RAM and Display support, and its connectivity. Before going further and comparing about these two, let us know little bit what these two are. ‘Exynos 7904’ and ‘Snapdragon 660’ both are the same on the ground that both are processor. What makes the differences is that ‘Exynos 7904’ is newly used processor by Samsung whereas the ‘Snapdragon 660’ is an old Qualcomm processor. The Samsung is going to change its trend of last two-three years, and now it seems that, is trying to changes its fortunes in the budget and mid-range Smartphone. At presents, market, especially the Indian market is full of Chinese manufacturers like Xiaomi, Honor, Realme etc that lead poor market of Samsung in India. By the chipset the Exynos 7904, the Samsung try to make strong comeback in this segment. This processor has set a launch with Samsung newly M series budget segment Smartphone. Samsung has launched the exynos 7904 chipset with its new M series Smartphone. The question rises here, whether this new chipset more powerful chipset in this segment. 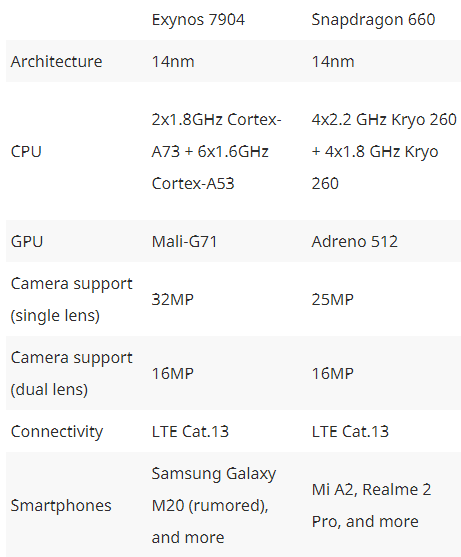 In this bracket, Snapdragon has 600 series chipset and MediaTek has P series. Snapdragon 660 is one of the most popular chipset of Snapdragon chipset. The mid-ranges devices that use Snapdragon 660 chipset currently are Asus Zenphone, Max Pro M2, Real Me 2 Pro, and Mi A2. The Samsung M series will be added soon in this segment. That brings confusion for all buyers which one they should go for; ‘Exynos 7904 or Snapdragon 660’. Lets us look comparative study between these two same segment chipset and know which one is the more powerful. Starting with CPU first, Samsung Exynos is build on 14NM FinFet process. It is a 64-bit chipset. It is octa-core chipset in which two of the cores are Cortex A-73 based with a maximum clock speed of 1.8 GHz for handling task. Whereas, the other 6 cores are Cortex A-53 based clock at a 1.6 GHz Clock speed- perfect for browsing, making calls etc. On the other hand, Qualcomm Snapdragon 660 is also the octa- core 64- Bit processor built on 14nm FinFet process. It has 8 kryo 260 cores clocked up to 2.2 GHz. Kryo 260 is a marketing term basically means four Cortex A-3 cores and 4 Cortes A-53 cores. It has two variants; some devices like Asus Zenphone Max Pro M2 are using 1. 95 GHz whereas the other likes Redmi Note 7 and Mi A2is clocked up to 2.2 GHz. Camera: Samsung Exynos 7904 image signal processor support 32 MP single camera, whereas Snapdragon 660 can support 25 MP single camera aand 16+ 16 dual cameras. RAM: Samsung Exynos 7904 can support LPDDR4X RAM and EMMC5.1 Based storage. Snapdragon 660 support eMMC 5.1 & UFS 2.1 based storage. It can also support Dual- Channel LPDDR4/4x RAM upto 8GB. Display: Samsung 7904 supports Full HD and Full HD+ Display up to 20:9. It terms of video playback, it can play Full HD video at 130 FPS and UHD Videos at 30 FPS. Snapdragon 660 can support quad HD (2560×1600). It has also the ability to support 4K external displays. Connectivity:Samsung Exynos 7904 has Wi-FI 802.11ac, Bluetooth® 5.0, FM Radio, GPS and LTE Cat 12 modem with upto 600 Mpbs download speed and 150 Mbps upload speed where as Snapdragon 660 has Wi-Fi, Bluetooth 5.0, GPS, FM Radio. It has an X12 Modem and it uses LTE CAT 12. It has download speed of 600 Mbps and 150 Mbps upload speed. Snapdragon 660 looks better chipset on the ground of camera, CPU & GPU, however, performance wise both are the same. You can prefer devices having any of the two chipsets.